There are many disciplines within the agency sphere. One that is often least understood is the Creative Marketing Agency. Sometimes creative is part of a larger agency. Sometimes they stand alone. But the most important way to look at a creative marketing agency is to think of them as molders and shapers. They’re builders that amalgamate all the strategic work that was done before they came into play and shift it around like putty to create something amazing (hopefully) that is sensible, sellable and accessible to your target market. So, who are these “creatives” we always hear about? Copywriter: This is the person that takes numeric / strategy data and shapes it into a storyline or an overall narrative. Designer: Once the story is created, it’s passed to the designer, who then transforms the story into a visual presentation that is both functional and appealing. The designer(s) can be both print & digital, and in some cases, they’ll call in videographers or animators to help tell the story. Creative Director: The creative director oversees the entire process. This person sets the tone of the project and keeps it grounded in terms of what is delivered, when its delivered, and at what quality. There are other supporting functions, like editors, digital specialists, project managers, and more. However, as you’d probably guess, a creative agencies success (or failure) depends highly upon the ability of this team core team (Copywriter, Designer, Creative Director) to find that mystical balance between what speaks to your audience, and what creates a trigger for them to act. Want to find that perfect creative agency? 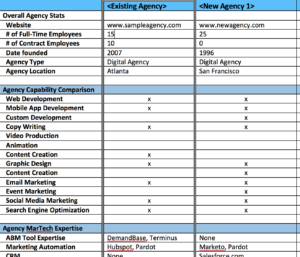 Visit this list of top marketing agencies, and drill down by the creative category.